Serbia's Novak Djokovic raises his arms after defeating Britain's Andy Murray during their semifinal match of the French Open tennis tournament at the Roland Garros stadium, Saturday, June 6, 2015 in Paris. Moving within one victory of completing a career Grand Slam, Novak Djokovic reached the French Open final by getting past Andy Murray 6-3, 6-3, 5-7, 5-7, 6-1 in the resumption of a suspended match. They played for an hour Saturday, after the semifinal was halted at 3-all in the fourth set Friday night because of an incoming storm. Murray grabbed that set, but Djokovic was superb in the fifth. 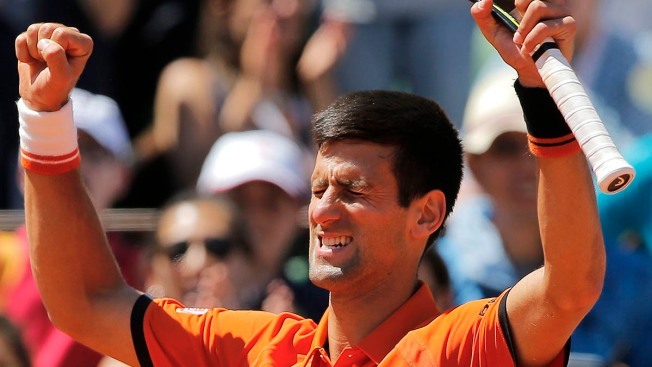 Djokovic already owns eight major titles, but none from Roland Garros, where he lost the 2012 and 2014 finals to Rafael Nadal, the nine-time champion he eliminated in this year's quarterfinals. The top-seeded Djokovic stretched his winning streak to 28 matches by beating No. 3 Murray. Djokovic will face No. 8 Stan Wawrinka of Switzerland in Sunday's final.